apart from sadaharu aoki & hidemi sugino, i was told that toshi yoroizuka (鎧塚 俊彦) is another prominent pastry chef in japan and if i were to go to japan i must visit his boutique at midtown tokyo. frankly, i've not heard of him so i googled and found out that this has quite alot of his recipes (i think its his official site). the only thing is they're in japanese and apart from ingredients used, the method & steps are not stated at all. this is actually not surprising consider that if you can attempt professional level cakes and entremets, you should hv already memorized the steps by heart. i wouldn't say i was very confident but i was up for the challenge. imagine, i had to rely solely on google translate to translate the text from japanese to english + make this without any written steps, its a little like playing with fire. 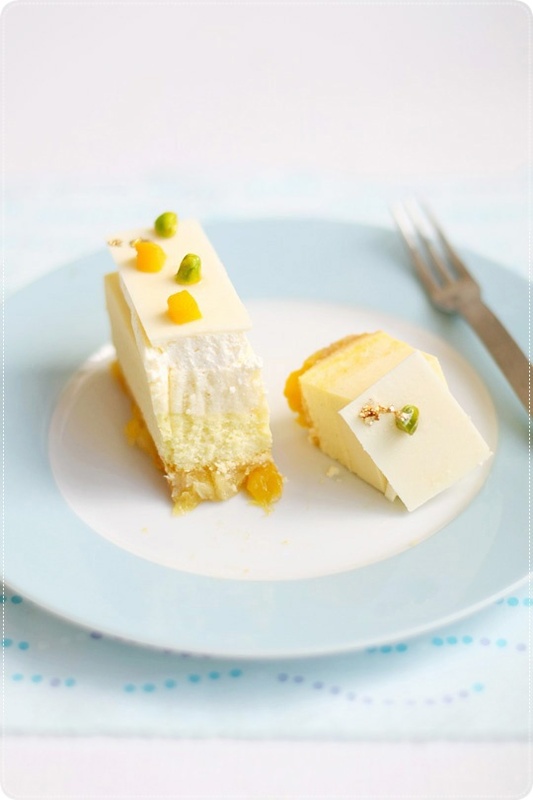 first of all, despite the fact that tropical fruits are so easily available in singapore, i've not tried making entremets with them...at least not with a medley of 2-3 fruits. the last time i made something tropical was the mango panna cotta verrines early this year so i just wanted to give it a try. secondly, it looked simple enough so the chance of me botching things up would be minimized. so i went ahead but i tweaked the recipe a little. the recipe uses an all-egg yolk lemon sponge but i thought it was too much yolks for a cake so i used a japanese souffle cheese sponge instead and added lemon zest to it. for the pineapple in the compote, i used canned pineapples instead of fresh for fear that it wouldn't set due to the bromelain enzyme. anw this look gorgeous (as always, *rolls eyes at myself* haha). ur layers are so even, and the slicing really looks super neat now! practice really does make perfect. and whats the garnish u use? mango, pistachio and...gold foil? i rmb u say u bought ur gold foil at med hall? is it exp? ive tried asking a few med hall do they sell gold foil they look at me blankly and say no. LOL. I really like, not only eating cake singlets, but also they are so beautiful to capture, it hows how much skill, and time it takes into creating a petit gateaux. Absolutely lovely and professionally done and very neat cuts! Your dessert always looks amazing! making me salivating over my screen. What a coincidence though, I've been thinking about making a tropical sort of entremet for this week but can't seem to decide the perfect components go into it. Your cake is flawless!!! thank you! 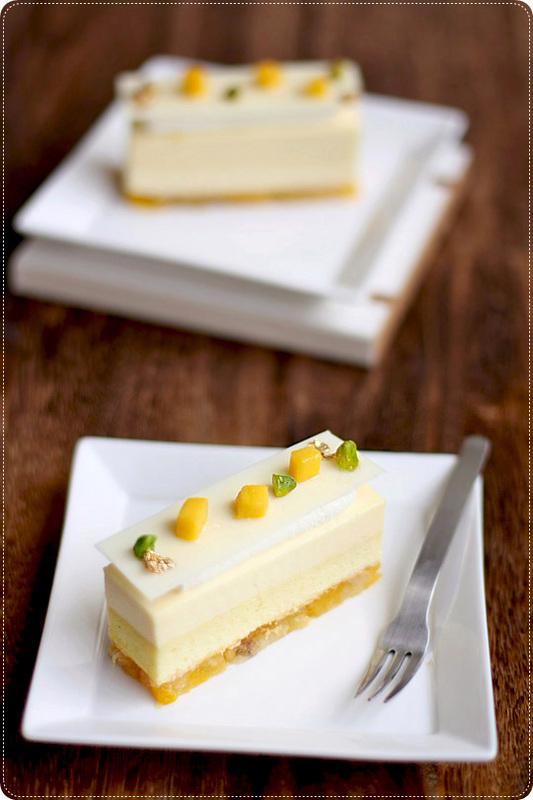 i think your desserts look fantastic, really can't hold a candle to you :) i think coconut, mango, passionfruit would go well together. can't wait to see your entry on it! haha, yea almost like twice a week now coz got TOO MANY recipes to try! hello, i recently started reading your blog and i'm VERY impressed with the level of detail and technique you put in to make your dessert! thank you, thats very kind of you :) you didn't leave yr email or blog address, how will i contact you in future? this is artistic. thanks for sharing the exotique compote recipe. i find it really good and'll try it next time. Truly impressive. 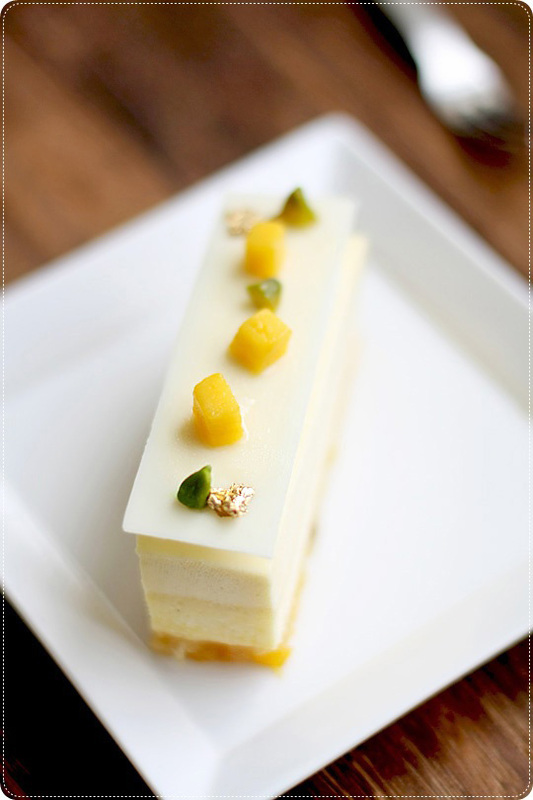 With the amount of time and effort in preparing this delicate dessert with all the beautiful details. I wish I could translate the website. It was very interesting in terms of his training in Europe.